opts = d2cOptions returns the default options for d2c. opts = d2cOptions(Name,Value) creates an option set with the options specified by one or more Name,Value pair arguments. 'zoh' Zero-order hold, where d2c assumes that the control inputs are piecewise constant over the sample time Ts. Linear interpolation of the inputs (modified first-order hold). Assumes that the control inputs are piecewise linear over the sampling period. 'tustin' Bilinear (Tustin) approximation. By default, d2c converts with no prewarp. To include prewarp, use the PrewarpFrequency option. Prewarp frequency for 'tustin' method, specified in rad/TimeUnit, where TimeUnit is the time units, specified in the TimeUnit property, of the discrete-time system. Specify the prewarp frequency as a positive scalar value. A value of 0 corresponds to the 'tustin' method without prewarp. Option set for d2c, returned as an d2cOptions option set. Consider the following discrete-time transfer function. 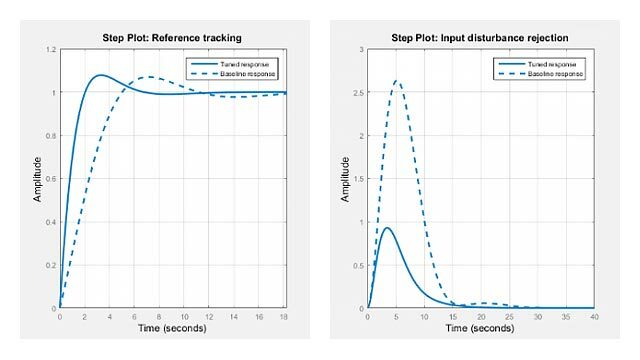 Create the discrete-time transfer function with a sample time of 0.1 seconds. Specify the discretization method as bilinear (Tustin) approximation and the prewarp frequency as 20 rad/seconds. Convert the discrete-time model to continuous-time using the specified discretization method. You can use the discretization option set opts to discretize additional models using the same options.